Back in March, we looked at Donald Trump cosplay—people who love to dress up as the Republican nominee for president, usually to celebrate the man rather than protest him. And ever since it’s only gotten weirder. Don’t believe me? 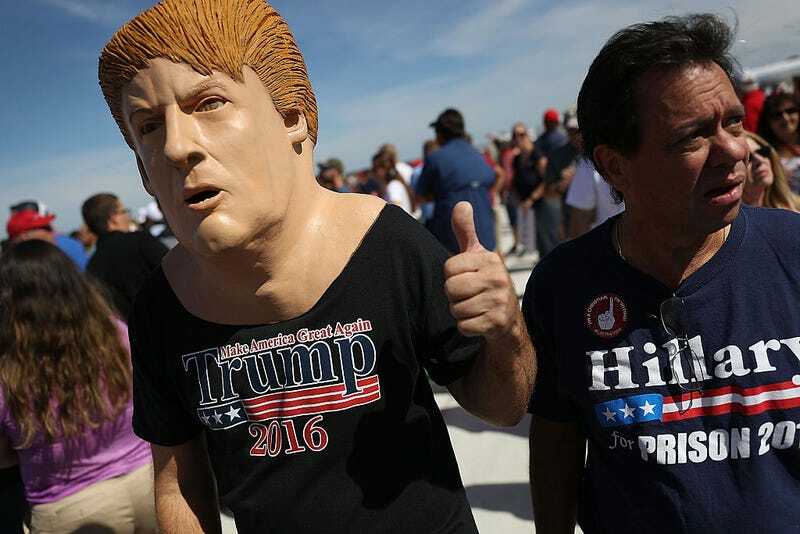 Take a look at some of the most recent Trump cosplay that’s been spotted across the country. Of course, there are still some people who dress up as Trump in protest of the —which is much more in line with political street theater of previous presidential elections. For instance there’s this guy who was spotted walking around New York today. The performance art was organized by Alison Jackson, a photographer famous for her celebrity lookalike portraits that are often mistaken for authentic photos. And then, of course, there are the people who prefer to dress up as Hilary Clinton in a prison jumpsuit and get choked out. Just a couple more weeks, folks. With any luck, we only have to endure this madness for a couple more weeks.